John Jackson picked up the 5th last-place finish of his NASCAR XFINITY Series career in Saturday’s Alsco 300 at the Bristol Motor Speedway when his #13 CrashClaimsR.us / Richie Anderson 1962-2019 Toyota fell out with suspension issues after 9 of 300 laps. The finish, which came in Jackson’s 32nd series start, was his second of the season and first since Atlanta, five rounds ago. In the XFINITY Series last-place rankings, it was the 7th for car #13, the 16th from suspension issues, and the 124th by a Toyota. Across NASCAR’s top three series, it was the 30th for the #13, the 40th from suspension woes, and the 312th for Toyota. 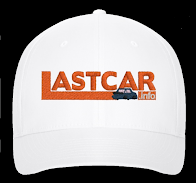 The finish also moved Jackson into the 2019 LASTCAR XFINITY Series lead, taking the spot from Jeff Green. Bristol would see Jackson make his fourth XFINITY start of the season, and only his second since the last-place run in Atlanta (following a 30th in Fontana). As the team had since Daytona, both Jackson’s #13 and Motorsports Business Management teammate Timmy Hill’s #66 would be old Toyota Camrys, as would Joey Gase in the #35. Only MBM’s fourth car, the #42 Amana Toyota driven by Chad Finchum, would use the new Supra body. 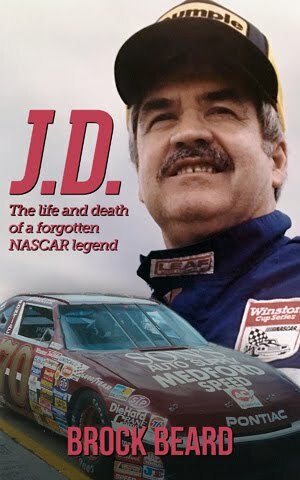 Jackson, Hill, and Gase would also run in honor of the late Richie Anderson, a racer who passed away on March 30, as all three would run large hood decals with Anderson's picture. With 37 drivers entered for 38 spots, all four MBM cars were guaranteed starting spots, regardless of speed. For Jackson, speed was indeed lacking. After skipping the weekend’s opening practice, he anchored the charts in Happy Hour, his fastest of twelve laps a mere 111.773mph (17.167 seconds), nearly 1.7 seconds off the lead. Jackson ended up losing a little speed in qualifying, turning in the slowest completed lap of Round 1 with a 111.119mph (17.268 seconds). The spot placed him 35th on the grid. Starting behind Jackson were 36th-place Stephen Leicht, last-placer in Daytona, in JD Motorsports’ #01 Food City Chevrolet, and 37th-place Jeff Green, last week’s Texas last-placer. Four drivers joined them at the rear for pre-race penalties: engine changes for 27th-place starter Gase’s #35 and 16th-place starter Zane Smith in the #8 The Cosmopolitan of Las Vegas Chevrolet, unapproved adjustments on Jeremy Clements’ #51 All South Electric Chevrolet, and a backup car for David Starr’s #52 Whataburger / Shoun Trucking Chevrolet. 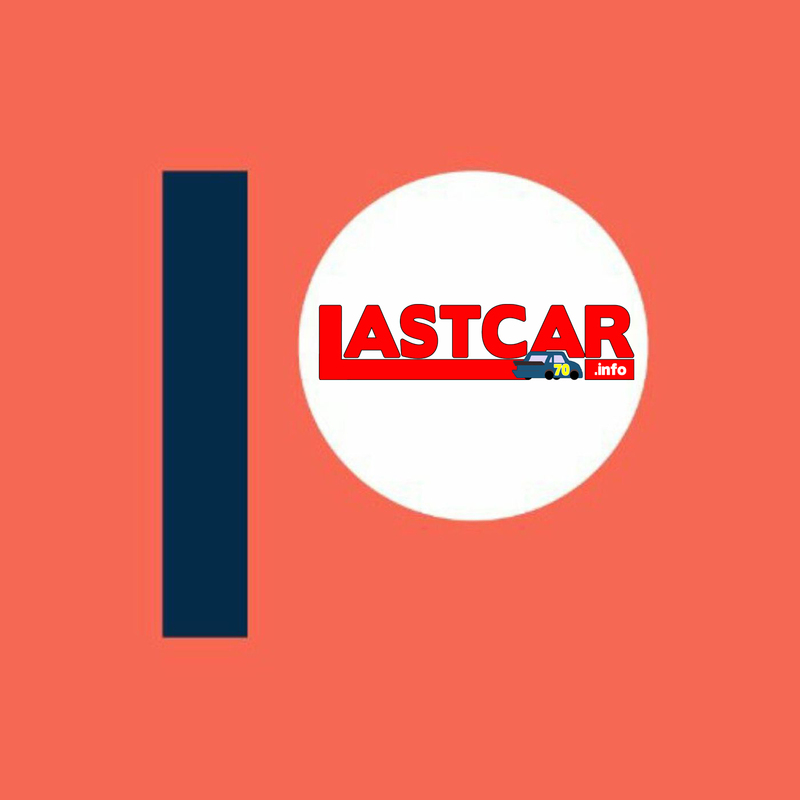 According to Starr’s Twitter, the primary car had sponsorship from Chasco but was damaged after something broke in the right-front of the car during opening practice, sending him into the wall and the team scrambling for a second car. 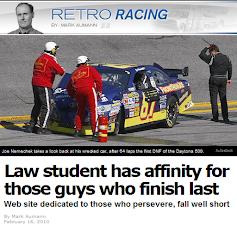 When the race started, Jackson fell to the 37th spot, and was the first to be lapped on the seventh circuit. Moments later, as NASCAR officials alerted the #13 needed to pick up his speed, Alex Labbe slowed on the apron and came to pit road. After starting 17th in Mario Gosselin’s #90 Auto Credit National / Auto-National.com Chevrolet, the stop also dropped him laps down. Jackson then pitted, only to pick up a commitment line infraction and pit a second time on Lap 15. This time around, Jackson pulled behind the wall, done for the day. Labbe also took a trip to the garage for nearly 90 laps, returning to action in Stage 2. Only then did Jackson fall to last. Labbe finished 31st. During Jackson and Labbe’s issues, both Josh Bilicki in the unsponsored #93 RSS Racing Chevrolet and Morgan Shepherd in the #89 VisoneRV Chevrolet pulled into the garage with an ignition and water pump issue, respectively. Jeff Gren’s day ended on Lap 40, when he lost a radiator hose in Turns 1 and 2, spraying water on the track. Green’s #38 slid into Ross Chastain, who had qualified a strong 12th in the #4 Food City Chevrolet. The crash tore the passenger side door panel from Green’s car and destroyed the rear clip of Chastain’s machine, taking both cars from the race. Two other MBM cars had fine runs on Saturday. Hill finished in 17th, hanging on to a lead lap run until Lap 35 and remaining in the Top 20 for nearly the entire race. It was Hill’s best series finish since last summer at Daytona, and his best in 12 series starts at Bristol. His previous best at Bristol was a 21st in the spring of 2014. Hill finished two whole laps ahead of Finchum’s #42 Supra, whose 20th-place finish was second-best of 2019 behind his 19th at Phoenix. Finchum managed this despite slowing suddenly in Turn 4 during the final laps. Gase in the third MBM car finished 27th. 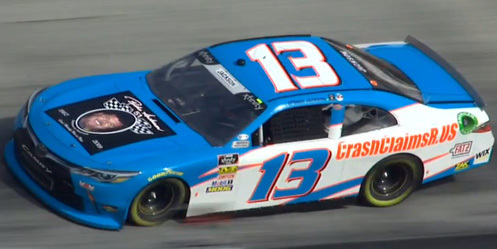 *This marked the first time car #13 has finished last in an XFINITY Series race at Bristol, and the first time an XFINITY last-placer at Bristol fell out with suspension issues. I noticed a couple of typos. 38th place Stephen Leicht and 39th place Jeff Green, Jackson fell to the 38th spot. On another note if Jackson continues to run fewer laps than Green we could have a new Lastcar champion by the end of the season. Thank you for the heads-up - my mistake; looks like I got the car count wrong in this version.